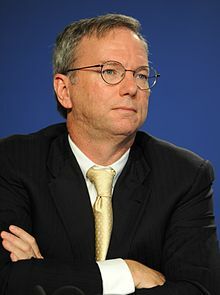 Executive Chairman o Alphabet Inc.
Eric Emerson Schmidt (born Aprile 27, 1955) is an American saftware ingineer, businessman, as well as the executive chairman o Alphabet Inc (umwhile named Google). In 2016, Forbes ranked Schmidt as the 100t-richest person in the warld, wi an estimatit wealth o $10.8 billion. ↑ Corona Brezina (July 15, 2012). Sergey Brin, Larry Page, Eric Schmidt, and Google. Retrieved December 30, 2012. ↑ Tim Walker (December 14, 2012). "Is the executive chairman of Google really the arrogant defender of tax avoidance that his critics claim?". London: The Independent. Retrieved December 17, 2012. ↑ Hart, Kim (June 9, 2008). "Google News, or Lack Thereof". washingtonpost.com. Retrieved December 19, 2012. ↑ "Google's Eric Schmidt talks about how to run the world (not that he wants to)". Los Angeles Times. ↑ Reuters (April 21, 2012). "Google ex-CEO Eric Schmidt's salary rises to $1.25 million from US$1". The Times of India. San Francisco. Retrieved April 21, 2012. ↑ 7.0 7.1 "Eric Schmidt". Forbes. December 1, 2011. Retrieved December 1, 2011. This page wis last eeditit on 14 Apryle 2016, at 16:54.